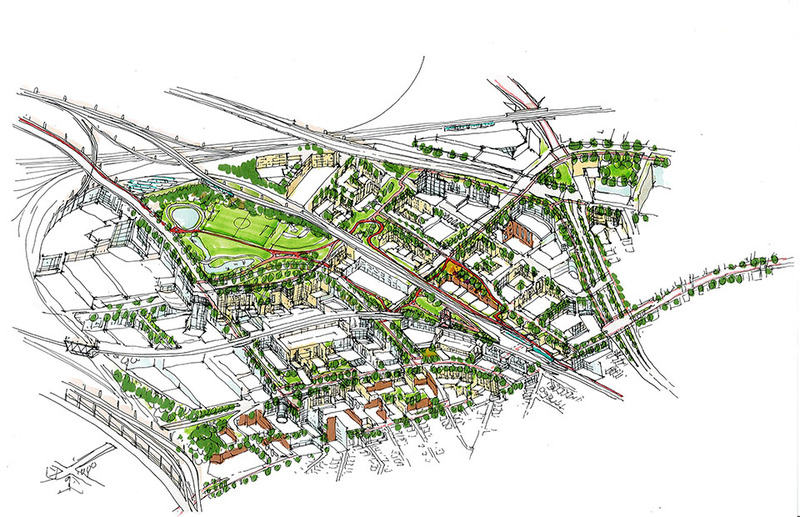 CRJA-IBI Group, as members of the Goody Clancy team, received a 2014 Urbanism Award from The New England Chapter of the Congress for the New Urbanism for the Inner Belt Brickbottom Plan. CRJA-IBI Group provided landscape architectural services focusing on a design vision and public realm framework for the Urban Streetscape and Adaptive Reuse Plan for the Inner Belt and Brickbottom Districts of Somerville. JUROR’S COMMENTS: The Inner Belt Brickbottom plan presents a vision for a 150-acre site surrounding a future transit station scheduled to open in 2017. The project team addresses economic development opportunities, presents a multi-modal transportation analysis, and provides a vision for increased housing, open space and site connectivity. The jury was impressed by the organic nature of the plan, as it assumes an incremental development approach that is composed of both small, simple tactical programming interventions and larger, more complex building and infrastructure investments.